She's hip and happening, an energetic live act, the modern woman and a mother - Hadiqa Kiani is the only female musician who has been able to stick around in the pop music industry for over a decade. That in itself is reason enough to be celebrated. But that is not why she is Instep's chosen hotstepper of the week. These days, Hadiqa is flying high as her latest collaborative effort, 'Living This Lie' with guitar genius Aamir Zaki is out and is all over the airwaves. It is this effort of hers that caught our attention. Hadiqa has consciously strayed away from her folky-pop sound and gone for a mature, moody sound with Aamir. That she has had the courage to experiment – she has sung in English on the entire album – is a commendable fact. More so because she has had a successful career singing in Urdu with bits of Punjabi thrown in. English is an about face and it is this turn that proves that Hadiqa is not afraid of reinvention. To evolve constantly is essential and Hadiqa understands this. 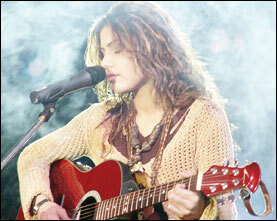 For music aficionados, Hadiqa has pulled a music coup that no other musician has been able to in a very long time. And that is getting Aamir Zaki to do a full-fledged album after a decade. Had Hadiqa not agreed to sing in English, it may never have happened. For a long time, long before Annie and Rabi Peerzada came onto the music scene, Hadiqa has been the sole woman in the local pop music world, collaborating throughout her career. She was the only woman singer in the new version of Najam Shiraz's 'In Say Nain' video and similar was the case with the anti-terrorism song, 'Yeh Hum Nahie' where she teamed up with Ali Zafar, Strings, Haroon and Ali Haider. Last year at the Lux Style Awards, Hadiqa rocked the house with her performance. It may not have been live, but as far as lip-syncing goes (it really is an art to pull it off), she is as good as it gets. Over the years, Hadiqa has taken Pakistani music to various parts of the world via her rigorous tours to USA, Canada, UK, Middle East and Norway. She is the first Asian woman singer to get signed by Pepsi International (the second in the world after Gloria Estefan), she is the only female singer to have performed at international events with other musicians like Lisa Stanfield and Michael Learns to Rock featured. And hey, she can act too! The 'Iss Baar Milo' video is a prime example. And Hadiqa is our answer to Angelina Jolie. In October 2005, after Pakistan was hit with a devastating earthquake, she went ahead and adopted a boy! And has admitted to Instep that it was the best decision of her life. For aspiring female musicians, Hadiqa remains an example. Ultimately, as long as Hadiqa is around, there is still hope for women in the patriarchial music world of Pakistan.